Primers are often forgotten about in makeup routines, especially when you’re in a rush. I know I have to put mine right next to my foundation so I’ll remember to use them. So, as I’m actually trying to make an effort to use them more, I thought I’d go through my favourite five for smoothing, brightening and colour correcting. Oh and make sure you check vouchers sites like VoucherBin UK for discounts if you fancy picking one up yourself! The Smoothing Ones | You’ve gotta love those primers that smooth everything out, making a more perfect base for foundation. I find these work especially well if your skin is looking a bit uneven or you’re having a bit of a bad skin day, as they blur the skin and your foundation sits so nicely. 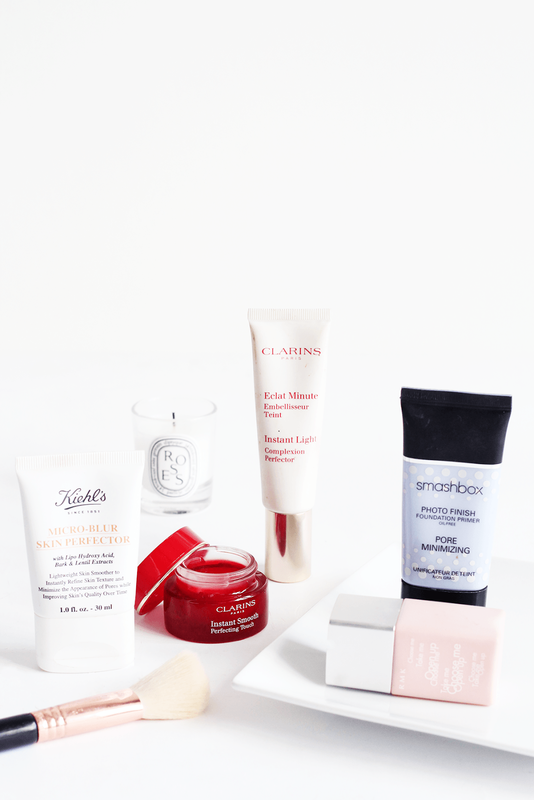 My favourites are the Clarins Instant Smooth Perfecting Touch, as the pot seems to last for ages, and the Kiehl’s Micro Blur Skin Perfector, which is slightly tinted for a more even finish. The Pore Minimising One | I have large pores around my nose and, well, no one likes to have large pores. Amiright or amiright? The Smashbox Pore Minimising Photo Finish Primer works a treat for filling in those pesky pores and creating an ultra smooth base for foundation. The Glowy One | If my skin is feeling a bit lacklustre or I just fancy having that lit-from-within kinda glow, the Clarins Instant Light Complexion Perfector works a treat. Mine is in a pinky shade, so not only does it correct my skintone slightly, but the shimmery particles in it give my skin a radiant look, without looking shiny or glittery. The Colour Correcting One | I do suffer from a dull and uneven complexion, thanks skin, so one thing I often reach for is the RMK Colour Control. It’s a pinky shade which counteracts dullness and the more blue tones in the skin, so it’s perfect for a little pick me up! Some of these items might have been sent to me for review purposes, see my full disclaimer here. Collab post.